Everyone is outraged about a barge spilling oil into the Mississippi—perhaps everyone forgot that it is a massive toxic cesspool every other day of the year, too. The Mississippi River, maybe the nation's best-known waterway, also happens to be one of the filthiest. Thanks to the obscene amount of pollution that gets dumped into it, scientists and conservationists have dubbed the Mississippi "the most tainted coastal ecosystem in the world" and the "most polluted river in the river in the country." It's a massive, bona fide toxic cesspool. Yet everyone's freaking out because a barge spilled a little bit of oil into it last weekend. 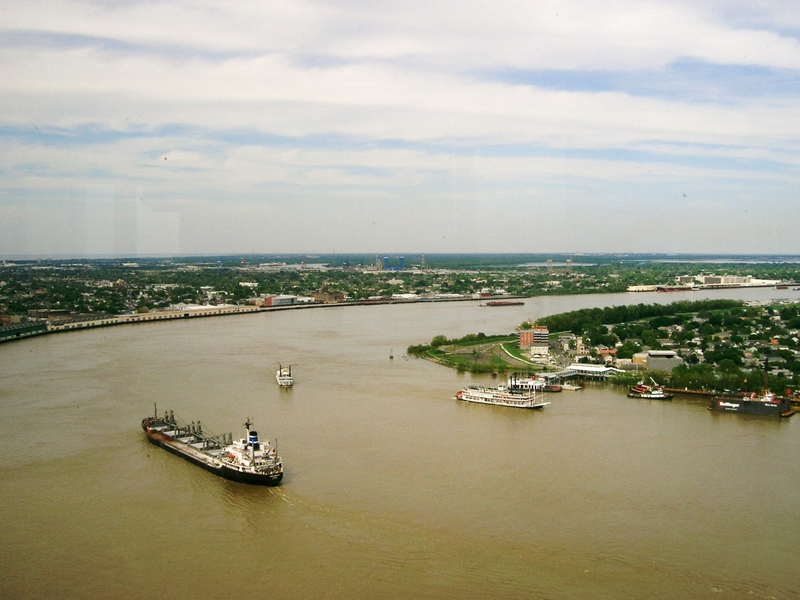 An oil barge owned by General Electric crashed into a towboat between New Orleans and Baton Rouge, and spilled an estimated 31,500 gallons of light crude oil into the river. This is about the size of an average recreational swimming pool. The incident closed 65 miles of the river to boat traffic, and snagged headlines around the world. Any amount of pollution is certainly not ideal; crude oil is toxic, and will be poisonous to the local marine life. Any local marine life, that is, that has managed to survive a decades-long barrage of toxic chemicals that have been dumped into the illustrious waterway. A 2012 report from Environment American Research and Policy Center found that over 12.7 million pounds of toxic chemicals—arsenic, benzene, mercury, and nitrates among them—were dumped into the river in a single year. "Over 125 million pounds of toxics were released into waterways tributary to the Mississippi in 2010—more than half the total released in the entire United States," the report says. Since one gallon of oil weighs about 7 pounds, by way of comparison, the solitary oil spill loosed 217,000 pounds of oil into the Mississippi. In other words, every year we dump approximately 576 times more toxic pollution into the Mississippi, and nobody cares. That is a truly colossal amount of pollution, much of it more toxic than oil. A lot of it is fertilizer runoff from the hundreds of miles of adjacent farmland the river traverses—and yes, it's the same nitrate-rich stuff that's causing the giant dead zones in the Gulf of Mexico. The Mississippi is pretty much a nonstop flowing pollute-a-thon every day of the year. Yet a single, relatively small oil spill nabs the headlines. Why? It's almost certainly thanks to the optics: a boat crash followed by an oil spill in the nation's biggest river makes for an easy hook. Americans love getting outraged about oil spills, after all, even if we're not so keen on doing much to prevent them from happening again. But the fact that the Mississippi is an unpluggable font of toxic sludge? That's just depressing. I'll take my tales of environmental degradation beginning and an end, thanks. This is sort of the same problem we face in telling stories about global warming—here's this terrible phenomenon, and it's systemic, and a huge hassle to address, and it's pretty much the same story every time we hear about it. Humans are spewing out too much carbon pollution, and it's screwing up the climate. It's a sort of sustained outrage that eventually ossifies into banality. With the Mississippi, farmers and industry are dumping out too much fertilizer and industrial waste, and generally treating the river more like a sewer than a historic, ecologically vital waterway. We'd have to enact unpopular rules to constrain runoff or better regulate pollution—our agricultural system would have to evolve. But change is hard, and our attention spans are short, so this is easier than considering dead zones, arsenic, fracking waste, and millions of pounds of toxic runoff: Oil spill shuts down big river. Next story, please.